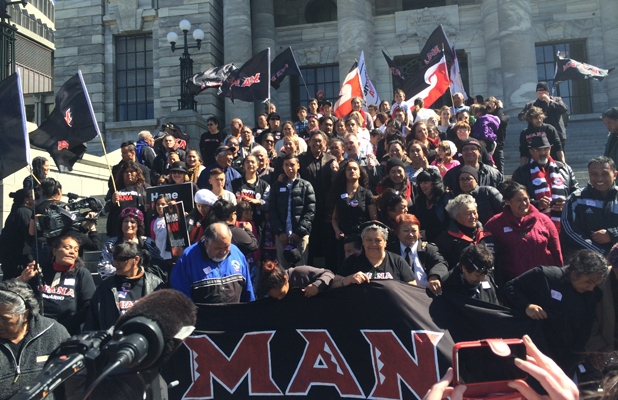 Ten years ago I led 50,000 Maori on the historic FORESHORE AND SEABED MARCH from Te Rerenga Wairua to the very steps of this parliament, in a march against the greatest land grab in the history of this country – Labour’s theft of the foreshore and seabed – a watershed moment for Maori because it wiped away any illusion that Labour would put Maori rights ahead the interests of big mining; because it showed that the colonial past of land thefts was still very much alive; and because it led to the formation of the first ever independent Maori political party – THE MAORI PARTY. Those were the wonderful days when it seemed all of Maoridom spoke with one voice – days that quickly ended when the Maori Party did A DEAL WITH NATIONAL at the next election in 2008, and although it quickly became clear that we were being overwhelmed, the leadership of the Maori Party ignored my pleas for us to stop accepting National Party lies over the advice of our own experts, and supporting tax cuts for the rich, billion dollar bailouts for failed finance companies, benefit cuts and the privatisation of prisons. But the final straw came when the Maori Party accepted National’s version of the Foreshore and Seabed Bill – the MARINE AND COASTAL AREAS BILL – a bill which has seen not one grain of sand returned to Maori in the 5 years since it became law. That was the when I resigned from the Maori Party, resigned from parliament, and with the support of the people of the north and tautoko from around the country, won the seat back as the leader of the newly minted MANA MOVEMENT, and held it again in the election of 2011. MANA defined its position when we announced that our constituency would be those we call TE PANI ME TE RAWAKORE, the poor and the dispossessed, and our last three years have been a challenging and vigorous time where we have staked out our place in the political world – a commitment to ending poverty for all and particularly those most vulnerable in our society, our kids; a commitment to putting an end to the grinding homelessness affecting tens of thousands of New Zealand families; a commitment to putting the employment of people ahead of the sacrifice of jobs in the endless pursuit of wealth for the few; and a commitment to a future where the Treaty of Waitangi is honoured as the basis for justice and good governance in Aotearoa. Mind you – being so highly principled brings with it enormous risk, not least the fact that KIDS CAN’T VOTE AND POOR PEOPLE DON’T, but I am proud of what we have achieved in our short time in parliament. When we first raised our FEED THE KIDS policy three years ago, everybody laughed, so we took our kaupapa on the road, we built a support coalition of more than 30 national organisations, we pushed the policy into the top 5 issues of the year, and with the support of a standout series on Campbell Live, we got a poll last year that showed more than 70% supported a government-funded food in schools programme. When we called for 10,000 NEW STATE HOUSES EVERY YEAR until the housing crisis was over, other politicians squirmed, but after challenging them at a Housing Action protest outside parliament, Labour took up the same call for 10,000 new houses a year, albeit theirs was more a pitch to woo middle-class voters than a bid to help the poor. We took up the call for FULL EMPLOYMENT because to accept anything less was to accept failure, and by pushing for the minimum wage to be the LIVING WAGE OF $18.80 AN HOUR, we forced other so-called left-wing parties to follow suit. We created a space for those of the Ratana faith to meet in parliament, out of respect for TW Ratana’s commitment to the Treaty of Waitangi, a space that I sincerely hope that Rino Tirikatene and Adrian Rurawhe will honour in my absence, and we also allowed my parliament offices to be used as neutral ground for warring gangs – not exactly parliamentary business but certainly the business of MANA. And as I leave, I lay down a challenge to this parliament. My FEED THE KIDS bill is live in parliament as we speak, a bill which already has the support of Labour, the Greens, New Zealand First and the Maori Party, a bill to provide what the people of New Zealand have called for – a comprehensive, government-funded food in schools programme. It is ready to be passed at the first sitting of parliament, and if it did, I know it would gladden the hearts of all good Kiwis, please the mums who are struggling to get by, and fill the stomachs of the 100,000 children still going to school hungry every day. This is not my bill. This is a bill for the children. And I call on this parliament to pass it as a show of faith in our own future, and a show of love for those of our children who desperately need our help. We have a full-blown housing crisis in Aotearoa, with 30,000 families officially listed as homeless – families living in cars, cowsheds, cockroach-infested caravans and garages, or in cold, damp, overcrowded, unhealthy homes, because rents are too high, and the cost of a new home is out of reach. I call on this parliament to stop the sale of New Zealand homes to non-resident foreigners, to stop the sale of state houses to private developers, to renovate or replace those that need them, and to commit to a full programme of building 10,000 new state houses every year until the housing crisis is over. All it takes to eliminate homelessness and employ thousands of people in the housing industry is political will. Government also has the responsibility of managing the economy, and just as importantly, ensuring that that economy meets the needs of its people rather than the profits of its parasites, and I call on this parliament to restructure our economy to suit just such a purpose; to invest in community work programmes; to give life back to communities all around our country devastated by asset sales, asset stripping and corporate greed; to create employment for all of its citizens so that instead of wasting billions and billions of dollars every year in needless and mindless welfare dependency, that that money is used to engage communities in rebuilding their future, engage whanau in rebuilding their lives, and engage people in rebuilding their love for work. And as I leave, I do so in good heart, for over the past couple of weeks I have travelled the MANA nation, and felt the love and the passion that is the lifeblood of MANA, and the commitment to continue our work: from Kaitaia to Kaikohe, Whangarei to the North Shore, West Auckland to Southside, Waatea to Waikato, Hamilton to Gisborne, Rotorua to Taihape, Christchurch, and here in Wellington. Our meetings have not been the sombre and tearful farewell tour for Hone Harawira that others may have hoped for, but rather a joyous and uplifting revival tour for a Movement that takes up the challenge of being the conscience of the nation, and of taking action in support of our kaupapa. I hear the mean-spirited and ugly voices of those who are desperately keen to see me go, but I don’t have time to respond because we’re too busy focussing on the tasks ahead. We are already organising to FEED THE KIDS, and working with other groups to get in behind our campaign. We will be calling on iwi up and down the country to open their marae to HOUSE THE HOMELESS. We will be organising INTERNET CAMPS for senior students and Maori communities so that our young people can fly the highways of the world. We are talking with work trusts about COMMUNITY EMPLOYMENT PROGRAMMES that can become a model for other communities to adopt. We will create COMMUNITY HUBS where the MANA message of hope and action can become the core of the communities we serve. We will MONITOR GOVERNMENT’S PERFORMANCE on steps they are taking to create real jobs with decent wages and safe working conditions, to house the homeless, and to eliminate child poverty, and we will also be challenging the opposition to keep the pressure on to achieve these goals. And we will march against THE HATED GCSB; we will mount a legal challenge against the MASS SURVEILLANCE that this government is conducting illegally against the people of New Zealand; we will continue to oppose THE TPPA that threatens the sovereignty of our very nation; and we will campaign for the return of OUR ASSETS. Believe me when I say that MANA will not be going gently into the night. And as I leave, I thank the thousands of NZers of all creeds and cultures for their fabulous support for me personally, and for their recognition of the work that MANA has done and continues to do as the voice for the voiceless. “Hone, I hope you get to read this. I am a 57 year old pakeha centre right voter (don’t throw up just yet) who was delighted with the result of the election, with one exception. That exception is a big one, and one I believe all NZ is poorer for, and that is, you are for the present, no longer in our Parliament. I have talked about this today with a large number of people who, like me, have had a reasonable amount of success in life, who support the current Government, and would on the surface appear to have little in common with you. The common feeling was that you are an honourable man with a strong and decent vision. While you made a bad call with your partners for this election, this shouldn’t define you, and I and the people I mix with, genuinely hope that after a little time out, you will regroup and then start the next campaign shortly. Good government needs strong opposition and Labour is too factional to provide that, the Greens are too narrowly focused, and the rest are a bloody joke. I like the fact that with you what one sees is what one gets. At times I wish you would learn to play with others better, but that’s you, so what the hell. I guess what I’m trying to say is that there is a strong feeling out here that NZ needs you; that not only Maori, but all New Zealanders will be missing out, by not having you in our House of Representatives. I hope out of this you will come back stronger than ever in your own right, without partners with baggage that you don’t need. Be your own movement! Happy are those who dream dreams, and are prepared to pay the price to make those dreams come true. Our dream, MANA’s dream, is for a society where Maori can stand tall, where te pani me te rawakore is just a line in a song, and where everyone can feel good about the contribution they can make as a citizen of Aotearoa. When I first came to parliament my people brought me here. Today I thank the MANA whanau for making the long journey to take me home. Your love and your support has sustained me through the darkest of days, and your joy and your happiness has been a constant source of strength. Long may it continue. And finally, to my darling wife, thank you for just being you, and for always being there for me.